Remember I mentioned that there are 3 mascaras that I have repurchased in recent years, the first one was revealed, and the second one is a cult favourite — Maybelline The Falsies Mascara. 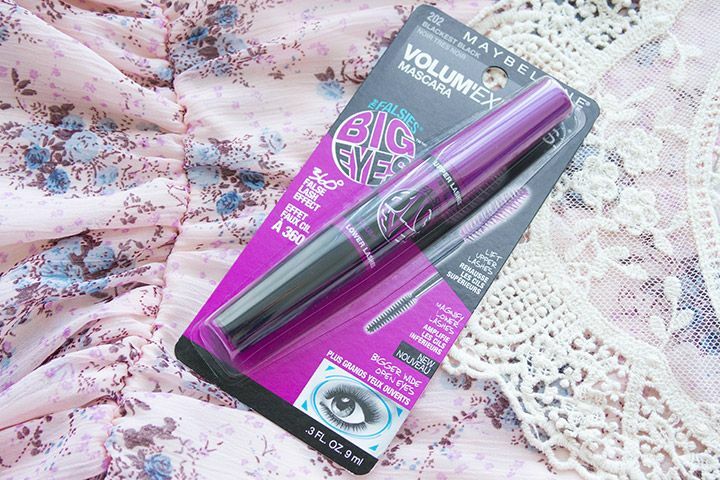 Truth be told, I'm not here to review the original The Falsies, rather its little sister — Maybelline The Falsies Big Eyes Mascara* (CA $10.99). 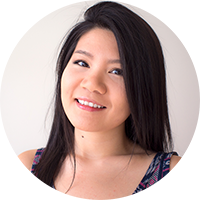 Mascara Monday is an irregular series of reviews about mascaras that are posted on Mondays. For your information, I have pin straight lashes that don't hold curl properly. They are also thin and not quite long. Coming out in the next month or so in North America, The Falsies Big Eyes Mascara is a dual-ended mascara for both your top and bottom lashes. It promises to "push up and fan out" your upper lashes and "magnify every tiny bottom lash without clump or mess". On the upper lashes side, it comes with a twisted brush (its twisted-ness is demonstrated above). For some reasons, I feel that this wand is supposed to be used with the "rolling technique". So I like to roll the brush outward from the roots of my lashes. I find that this way I get the most coverage and volume. To add more length, I would then go back and brush regularly through my lashes till I'm satisfied. On the lower lashes side, it comes with a thin and long brush. It's perfect for the bottom lashes because it's such a small brush, it can "find" all the baby lashes that you have. I also like to use it for the inner corner of the upper lashes because there are some baby lashes there that could use some magnification. 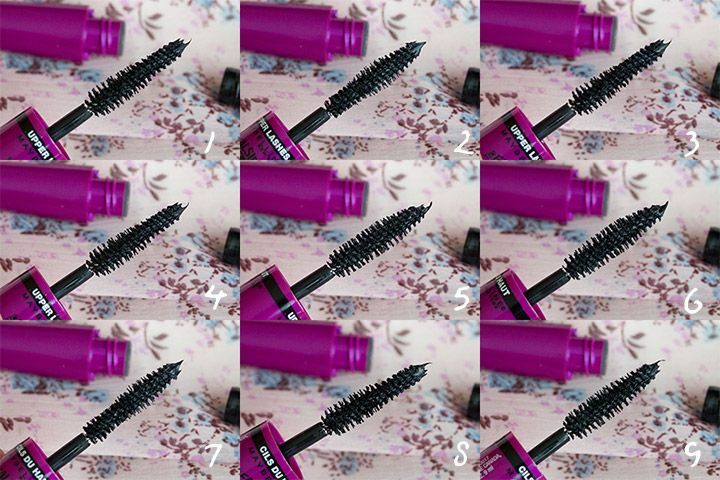 How the twisted is the Upper Lashes brush of The Falsies Big Eyes Mascara? As for the formula, I think both sides have the exact same formula. 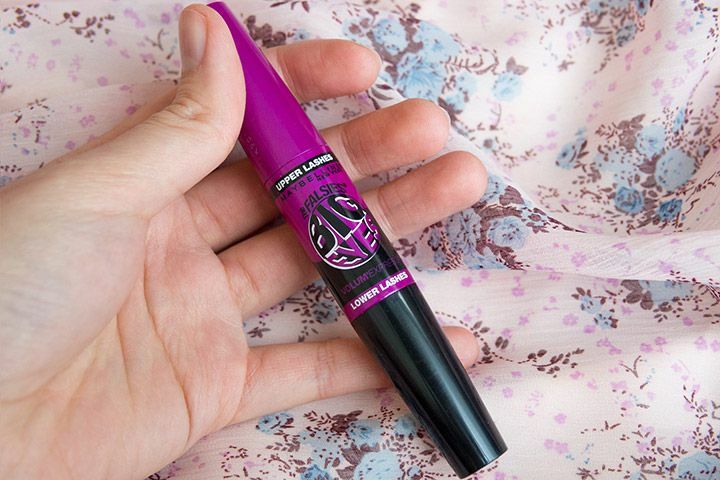 Maybelline claims that it is smudge-proof with great hold power. 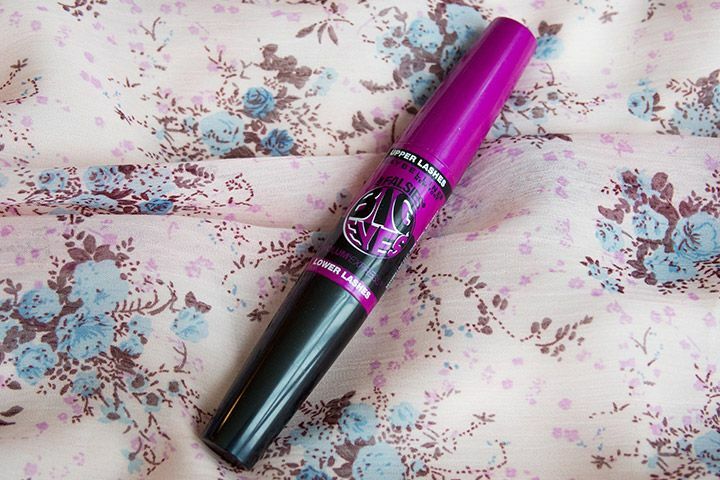 I have tested this mascara through regular and long days, windy and rainy days. On one super windy day, my eyes got super watery (I was tearing up) and it does smudge because I do have the regular formula here. When weather is nicer, it lasts through the whole working day (8 hours or so), but it starts to smudge when it hits the 9 or 10 hour mark, which is not bad at all. The formula is nice, not too wet, not too dry. It gives a nice curls, even though I think the formula is a little heavy that my lashes drooped a little when first applied. But that doesn't bother me, because it also hold curls quite well. I also like that the shade Blackest Black I have here is really black. It really makes your lashes show up more. 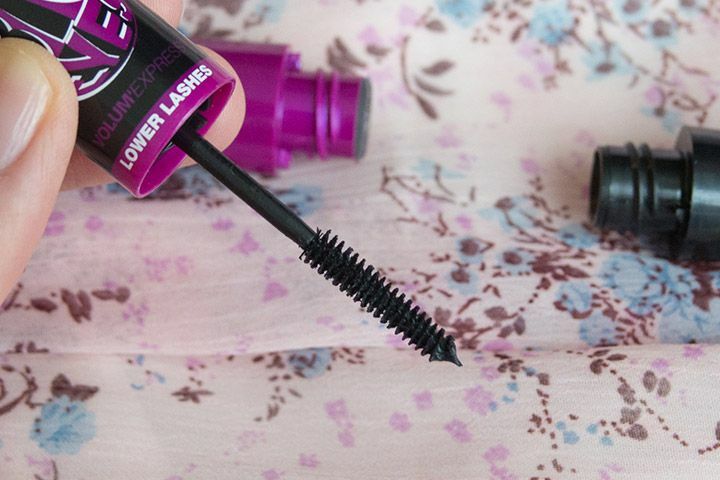 The best part of the mascara is definite the lower lashes side. I don't normally wear mascara on my bottom lashes because most things smudge on me, but this doesn't do that (on a regular day anyway). And holy cow, it makes a huge difference and really does help to achieve the Big Eyes effect! And let's take a look at how it actually performs (excuse my poor application, it was after work and I was tired). Overall, I really like this mascara, it definitely lives up to its family name, "The Falsies". It is quite long-wearing without the smudge mess on a regular day (but on windy or rainy days, you'll need something more waterproof). It also gives you volumized and length curls, along with those defined and magnified lower lashes. For more watery eyes, I would recommend to check out the waterproof version when it becomes available. On another note, I know this is super belated (and probably shouldn't be called Mascara Monday), but what the heck. It's originally planned to go up on Monday though, so it still counts, right? Oh, and doesn't this mascara reminds you the discontinued Maybelline XXL Volume Mascara and Lash Discovery Mascara? This looks amazing on you!!! Pretty good I have to say I'm impressed! Thanks Jess! I'm quite in love! Me too! I have started to wear mascara on bottom lashes again because of this! Like the result! Your lashes look amazing! Need to try this! I used to have a double ended mascara from AVON and it was amazing! It's so smart to do a mascara with a wand for bottom lashes too. lol... It "discover" your lashes... even those invisible ones! I actually like to use the lower lashes side to "find" the baby lashes on the upper lash line too! I love Maybelline mascara and Flasies flared is the only one I wear now. Wonder if this comes in waterproof. I'm in Canada also. Would you mind telling me where you got yours from? Awesome, detailed review. I've been wondering about this mascara...thanks for sharing your thoughts! I actually haven't tried any Maybelline Mascaras. I haven't seen this particular product in stores here, but I would really give this a try! esp for the lower lash brush... I never put mascara on my lower lashes because they are so so tiny and rare... this would be great for me! Thanks for the review..I haven't tried any mascara from Maybelline before.. I love Rocket mascara from Maybelline!it's awesome! I absolutely LOVE the Falsies! I don't use this one, but another one in that line. It's great that it doesn't irritate my very sensitive eyes, either! I love Eyemakeup & mascara is must. I used Maybelline masacara, not this one. I loved it.